Thanks to Gnarly Kitty, I discovered the hilarious videos of Bon, a Thai with a knack for clever satire. Bon is known for her blog and video series, Learn Thai the Bon's Way. But this month she started a new website, JaideeTV/ใจดีทีวี, on which she spoofs modern Thai culture. In particular, the video that caught my attention is a nature mockumentary about that strange creature, the farang. In addition to poking fun at foreigners in Thailand, it mocks Thais who try to mimic farangs, and the whole thing is a parody of the well-known Thai educational TV series กระจกหกด้าน. If you've ever seen the series, you know the parody is spot on. Because I think this video is so great, I created English subtitles for it. The translation attempts to capture the sense of humor of the original, rather than closely translate the Thai. Be sure to check out Bon's site JaideeTV, too. Enjoy! Here's an amusing item making the rounds. It is a letter that hails from Sri Prachan District, Suphanburi Province, a few hours northwest of Bangkok. An unfortunate employee of the local revenue office there who suffers from back pain was told she cannot use her own chair at work, because it makes her look like the boss. Click on the image to enlarge and read the Thai for yourself, but I've provided an English translation below. 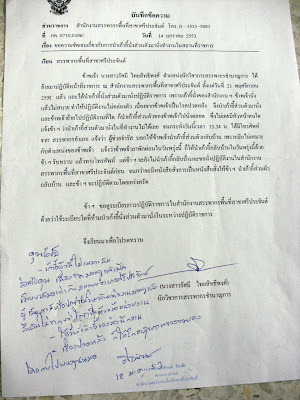 I, Mrs. Rasmi Thaisitthipong, a revenue expert for the Revenue Department, moved to the Sri Prachan Revenue Office on 21 November 2007, and brought a personal chair for use in the performance of my duties. The office chairs are uncomfortable to sit in, making be unable to perform my duties to the fullest, since I suffer from chronic back pain. Thus, I bring a personal chair, and have brought the chair with me to every office I have worked in. I have never had a supervisor inform me that I cannot bring a personal chair to work, until 3:34 p.m. today, when I received a phone call from the District Revenue Chief's office, informing me that Asst. Chamrat wants me to take my personal chair home, because it is not appropriate for my position. I was told to take a personal day tomorrow and to take the chair home. I acknowledge that I received the telephone call. However, I will not take the chair home, and request to continue to use it while performing my duties, until I receive a formal written order to take the chair home, in which case I will strictly obey the order. I also request to review the Sri Prachan Revenue Office regulations to determine which regulation forbids bringing personal chairs for use in the performance of official duties. - That chair isn't appropriate for you, because it looks equivalent to the Sri Prachan District Revenue Chief. Tax payers or others who come to the office are confused as to who is the office chief. - Use the office chair. - As for your back pain, you should take care of your health by seeing a doctor. A doctor! Now why didn't poor Rasmi think of that? I think this is a hilariously perverse example of bureaucracy in action. And the fact that its making its way around the Thai websphere means that it's not just me who finds this kind of thinking a few tarang wa short of a rai. Never mind that a doctor's advice would be to use an ergonomic chair to minimize stress on your back. If you're curious about who the characters are in this little tragicomedy of bureaucratic numbskullery, then look no further than the Revenue Department website: Suphanburi Revenue Department Administrators. The relevant players are in the left column. 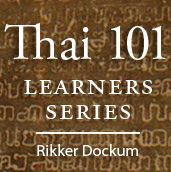 It's been a while since Women Learning Thai finished re-serializing my Thai 101 Learner's Series, which first ran as a biweekly column in the Phuket Gazette during 2008. The ever-patient Catherine of WLT managed to coax another installment from me, which went live last week. Have a look.